Today Australians for War Powers Reform launched a fundraising appeal through the crowd sourcing website pozible. The appeal is to enable us to produce and distribute to all members of Federal Parliament​ a new booklet for the campaign, edited by Dr Alison Broinowski and with contributions from a range of authors. our new booklet “HOW DOES AUSTRALIA GO TO WAR?” puts the government’s war powers under the microscope. The publication offers a diverse range of views from Australian experts in foreign affairs, defence, and law. With a foreword by the late Hon Malcolm Fraser, it examines the history of Australia’s wars, compares what we do with other countries, and explores new and more democratic pathways to war powers reform. Please support the campaign by circulating this fundraising appeal to your friends, colleagues and networks. Any contributions will be welcome. Australians for War Powers Reform believes the current process by which we decide to place the young Australians of the ADF in harm’s way is greatly flawed. The small group decision making in which the Prime Minister or a small group of Ministers decides (essentially a ‘captain’s call’) this important matter has led us into several disastrous campaigns since the 1960s – Vietnam, Afghanistan (twice) and Iraq (three times), and it has us currently facilitating air operations over Syria for no discernible purpose.Former Prime Minister John Howard’s innovation of bypassing the traditional role of the Governor-General in formally authorising ADF deployments has eliminated the important safeguard that the Governor-General is entitled to be assured that any proposed deployment is legal under international law. The avoidance of difficult questions from the Governor-General was fundamental to enabling John Howard to launch us into the illegal invasion of Iraq, with catastrophic results that will be clear to anyone who reads a newspaper or watches their evening news. Tony Abbott has followed the lamentable precedent set by John Howard and again launched the ADF into Iraq without authorisation from the Governor-General. This situation must change. We must bring about a situation where it is mandatory for our elected representatives to have a say and to make the final decision about any deployment. Parliament must decide. To that end a group of prominent Australians with relevant expertise have written a series of papers setting out the current situation, its consequences, and the options for changing it. Our new booklet “HOW DOES AUSTRALIA GO TO WAR?” puts the government’s war powers under the microscope. The publication offers a diverse range of views from Australian experts in foreign affairs, defence, and law. With a foreword by the late Hon Malcolm Fraser, it examines the history of Australia’s wars, compares what we do with other countries, and explores new and more democratic pathways to war powers reform. We now appeal to you, members of the public, to contribute a small amount to enable us to publish these papers in booklet form and send it to every member of Federal Parliament, and to key public libraries, as well as making it available to interested members of the public. It will be a valuable education resource for all concerned with policy, law, military and history. As we are reviewing the huge number of deaths and suffering, not least within families, resulting from wars of real or claimed necessity and wars of choice in this WWI centenary year, it is right and timely to consider how we can safeguard against being engaged in unjust wars in future – whether they be illegal or just badly judged. The best safeguard against further follies, in which our youth will inevitably be involved, is to ensure that decision-making processes are based on democratic principles and a well-informed electorate. Our objective is not focused on any narrow view or sectional interest. We are concerned that the youth of the future are spared being unwittingly involved in the horrors of futile, pointless wars where the national interest may be absent or seriously in dispute. 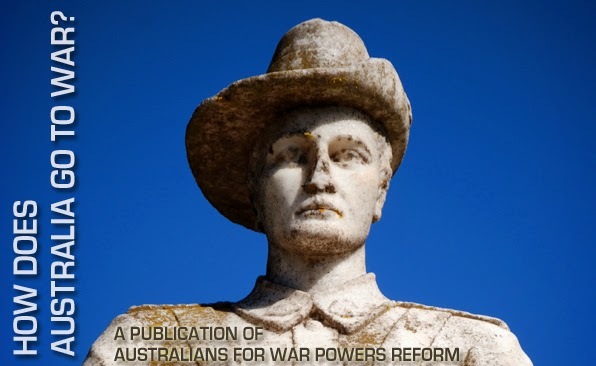 Your support for this project will help us to print a limited edition run of the new booklet, How Does Australia Go To War?It will allow us to distribute the booklet to all Federal Parliamentarians to encourage discussion around war powers. It will also make the publication available online through our website (iraqwarinquiry.org.au) and social media. This entry was posted in Blog and tagged Alison Broinowski, Australians for War Powers Reform, Decision-making, International law, Iraq War, Military history, Paul Barratt, Status of Forces, War Powers.